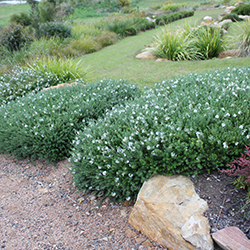 Our Australian native’s plants are greatly desired overseas, and it is any wonder, they are tough, reliable plants that work and look wonderful in many garden styles. In the past Australian native plants have often been thought of as untidy, but with breeders producing new cultivars, there is now tidier, even tougher Australian Native plants suitable for every garden. Landscape trees planted 50 years ago are not the same as trees planted today. Good landscape trees make a lot of sense, but what makes a good landscape tree in today’s modern landscapes? Luscious® Tristaniopsis is a vastly improved form of Tristaniopsis laurina. Wow these leaves are big. Its leaves are almost double the size of the original with a gorgeous lush shiny appearance. These are topped off with copper new growth at certain times of the year. Delightful fragrant yellow flowers complete the package. Luscious® Tristaniopsis makes a great Australian native alternative to the exotic magnolia. It’s highly suited for street planting, garden features, or for an elegant shade tree. Luscious® Tristaniopsis thrives in a range of conditions. It will tolerate frosts and drought, and a wide array of soil types. Luscious® Tristaniopsis will grow to 7-12m tall and will grow in full sun to part shade. The trunk is also a great feature as the bark has a striking port colour that peels back revealing a mottled cream stem. What more could you ask for? Luscious truly is a great Aussie tree. Sometimes you need a narrow growing small tree. Well these Pinnacle™ Syzygium fits the bill perfectly. Pinnacle™ Syzygium is a narrow Australian native Lilly Pilly, similar in shape to a Pencil Pine or narrow Conifer, but much better suited to the Australian climate. You can use it along walls, fences, as a screen, or even as a narrow wind break. Pinnacle™ Syzygium can be pruned to stay shorter than this, even as low as 2 metres, but it requires very minimal pruning to stay narrow. Pinnacle™ Syzygium works well in full sun and shade, and is suitable for most parts of Australia that don’t get much colder than minus 6 Celsius. It has beautiful red fruit that actually taste pretty good when ripe. So if you need a narrow tree or want some privacy, give Pinnacle™ Syzygium a go.